Tesco has announced plans to install almost 2400 charging bays at up to 600 stores over the next three years. 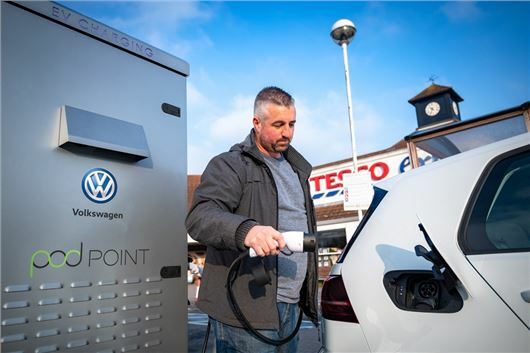 The charging bays, launched in partnership with Volkswagen and installed by Pod Point, will be based in Tesco Extra and Superstore car parks across the UK. Customers will be able to charge their electric cars or plug-in hybrids using a standard 7kW charger free of charge, or use a rapid 50 kW charger for a fee. Volkswagen hopes the initiative will help it to deliver on its pledge to sell one million electric cars a year worldwide by 2025. So far in 2018, 12,526 battery-powered cars have been sold in the UK, which is up 0.6 per cent since 2017 — according to data from the Society of Motor Manufacturers and Traders (SMMT). There are plenty of electric cars around at the moment, like the Volkswagen e-Golf we've been running — with more due over the next few years as manufacturers aim to keep up with stricter emissions rules. In July 2017 the Government announced that sales of new diesel and petrol vehicles would be banned from 2040, despite criticism that the UK's charging network isn't big enough yet to cope with a big surge in EV ownership. Tesco hopes that installing charging points in its car parks will help to support a low-carbon future by relieving some of the worry drivers have over the UK's limited charging infrastructure. "This agreement represents a 14 per cent increase in the number of public charge bays in the UK and is a monumental day for electric vehicle drivers," said Erik Fairbairn, CEO of Pod Point. Any extension of the charging network is to be welcomed, but let's hope that the queues at the charging points will not be as long as those at the tills.